One morning in 1994, Sudarmin and other farmers from the Buol District of Central Sulawesi, Indonesia, were walking to their farms when they came upon a team of workers, guarded by soldiers, chopping down trees in the surrounding forests. They were told that a road was being built. But soon they came to understand that this was just the beginning of a much larger operation. All of their customary lands and forests had been signed away without their knowledge or consent to one of Indonesia's richest and most powerful families for the creation of a massive 22,000 ha palm oil plantation. Over the next three years, the farmlands and forests used by over 6,500 families were destroyed. Sudarmin and his fellow villagers stood in front of trucks and attached themselves to trees, but with the military backing the operation, there was little that they could do. Today, their former farms and forests are blanketed by an endless monoculture of oil palms belonging to the PT Hardaya Inti Plantations company, owned by business magnate and political insider Murdaya Widyawimarta and his wife Siti Hartati Cakra Murdaya through their holding company, the Cipta Cakra Murdaya Group. Sulawesi is one of the main targets of the breathtaking expansion of oil palm plantations in Indonesia. Since 2005, the area under oil palm in the country has nearly doubled, and now covers 8.2 million hectares, about a third of all of Indonesia's arable land. With little land left for expansion on the island of Sumatra, where production was traditionally concentrated, companies are turning to the islands of Kalimantan, Sulawesi, and Papua. 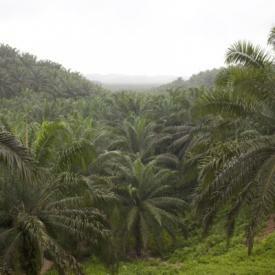 Several of Indonesia's largest palm oil producers are even expanding to the Philippines and West Africa. This expansion is fuelled by growing global demand for cheap vegetable oil for food processing and biofuels. But it's also a result of brutal inequality. The main players in the country's palm oil industry are cronies of former President Soeharto. They are now using their accumulated treasure chests and political connections to grab the lands of the country's most marginalised communities, often in collusion with foreign agribusiness companies and banks, many of them based in Singapore and Malaysia. Pt Hardaya Inti Plantations took over the Buol lands during the final years of Soeharto's reign. The company's owners, Murdaya Widyawimarta and Siti Hartati Cakra Murdaya, made their fortunes through lucrative procurement contracts with Soeharto's government, before diversifying into hotels, plantations and even shoe factories supplying companies like Nike and Lacoste. When the Soeharto dictatorship collapsed in 1998, they both moved more directly into politics, solidifying connections that run all the way up to the current President Susilo Bambang Yudhoyono. The other main shareholders of Pt Hardaya Inti Plantations are also big political players, notably the Minister of Women's Empowerment and Child Protection, Linda Armalia Sari and the son of the former chief of the National Intelligence Agency, Ronny Narpatisuta Hendropriono. Despite the powerful forces ranged against them, the villagers of Buol District were determined to get their lands back. A series of road blockades and other protest actions forced Pt Hardaya to negotiate a compromise agreement in May 2000, under which the company agreed to provide around 4,900 ha of land to compensate displaced villagers and to establish an outgrower programme – known in Indonesia as plasma farming - where the company would prepare and plant 2 ha of oil palms for each family and purchase the harvest at an agreed upon price. But just one month later, the company denied having made the agreement and instead offered only to run an outgrower programme on 15,000 ha outside of the concession area, on lands that the provincial government would have to identify. It was a painful setback for the villagers. Depleted from years of struggle and without any support for their cause from the government, their protests petered out and the company was able to move forward with its operations. 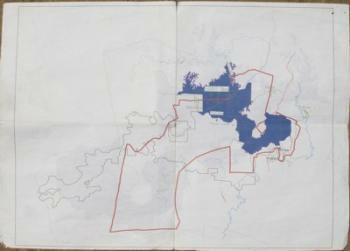 Left: Map of the land concession given to PT Hardaya Inti Plantations. The concession is marked with a clear(red) line. The dark area (in blue) is the 4,900 ha that the villagers are demanding be returned to them (Photo: Pietro Paolini/Terra Project). The situation for the villagers deteriorated in the years that followed. The company discovered that much of the land it had acquired was not productive, and so it began expanding outside of its concession area. Official maps show how the company encroached on several thousand hectares of lands, primarily on lands reserved for families that moved to the area under a Soeharto programme to resettle landless peasants from other parts of the country. The deforestation and planting of oil palms along river banks and on hillsides both within and outside the concession caused severe soil erosion, with much of the soil ending up in the fast flowing Buol river. "We used to get three floods per year on our paddy fields," says Yahyah, a peasant who moved downstream from the plantations in the mid-90s after his village was destroyed to make way for the concession. "Now we get floods six to eight times a month, and the flooding has destroyed our rice production." The company's promised outgrower programme has barely materialised. So far, just 400 ha have been allocated for the programme, and most of these lands have gone to the local politicians that supported the company. Paraman Yunus, a farmer involved in the outgrower programme, says that monthly payments by the company only amount to around $40 anyway. "The company keeps us in the dark about the price calculations," says Paraman. "And most of the revenue goes to pay off debts that we owe to the company for the initial costs of preparing the lands." Working conditions on the plantation are abysmal. There are over 3,000 people working on the plantation, many of whom lost their lands to the company. They live in dilapidated camps and are paid according to the amount they harvest. Hamsi is one of these workers, living with his wife and children in a cramped room in one of the work camps on the plantation. He and his wife have been working long, hard weeks here for the past 13 years. "No matter how hard we work, we are always in debt,"
It is not only the meagre wages paid by the company that keep its workers poor. The company constantly makes deductions for all kinds of expenses – from the electricity and water they use in their homes, to the tools and safety equipment that they need for work. By the end of each month, Hamsi says, there's no money left. Hamsi's wife, like other women workers in the plantation, is responsible for spraying pesticides. One of the pesticides used extensively in the plantation is Gramaxone (paraquat), an herbicide that is banned in over 30 countries due to its severe impacts on human health. She says she was not provided with training or protective equipment by the company, and that she sprayed pesticides throughout her pregnancies and soon after child birth, as she could not afford to take unpaid days off from work. Left: Abdulah Rahman, leader of the union of workers on the PT Hardaya Inti Plantations oil palm plantations in Buol, Central Sulawesi. Rahman was laid off by the company immediately after he led a delegation of workers and peasants to the National Human Rights Commission in Jakarta in 2012 (Photo: Pietro Paolini/Terra Project). In 2012, the leaders of three of the villages that were destroyed by the plantation established contact with the national peasants' movement AGRA. By then, the plantation workers had also formed a union and had begun pushing for better working conditions. Together they decided to take up the fight against the company once again under the banner of Forum Tani Buol. In October 2012 they sent a delegation of leaders to Jakarta to meet with the National Human Rights Commission and to negotiate with the company at its head offices. They then organised a road blockade and occupied the mayor's office. In each case, the government and company officials responded with promises to pursue a settlement of the land conflict based on the original May 2000 agreement. But nothing materialised. Frustrated with the lack of action, peasants and workers took over the company's processing factory in March 2013. The government sent in the military to remove them, but not before they managed to wrest another promise from the government to impose a resolution. Despite the years of failed promises, the villagers are optimistic that they are close to getting their lands back. They say that the local government is finally taking their side, and they now have a government sanctioned task force and the National Human Rights Commission backing their claims. The company's owners are also in a weakened position. Siti Hartati Cakra Murdaya is currently serving a 2.5 year jail sentence for bribing a Buol official for permits to expand the company's plantation on lands outside of the concession area. The villagers are even starting to discuss what they will do with the lands once they get them back. They are in agreement that the lands should be managed collectively and not through individual ownership and they recognise that they have little choice but to keep producing palm oil until the current trees are fully mature and can be replaced by other crops. The problem, however, is that the company is not acquiescing. Last year, it failed to show up for a meeting with the villagers organised by the local government, and there is understandable fear that the company might leverage its deep connections within the government and the army to derail a resolution once again. The experiences of the communities in Buol shows how the profound impacts of oil palm plantations on local communities get worse over time. The meagre benefits that a plantation provides, whether in jobs or through outgrower programmes, are no substitute for the loss of access to and control over lands and water that communities use to ensure their food needs and livelihoods. "We used to get all the food we needed out of one cropping season," says Samisar Abu, a mother of three who lost her family's farm lands to PT Hardaya Inti Plantation. "My parents earned enough from farming to pay our school fees, but now I cannot do the same for my children." Over the 20 years that the Buol villagers have struggled to get their lands back and improve working conditions on the plantations, they have seen little but empty words from the company and the government. The only real gains they have made in their struggle have come from direct actions. They were able to force progress in negotiations only through road blocks and occupations. The risk with such actions, however, is violent repression. If this last round of actions fails to secure lands for the villagers, the conflict is bound to escalate. It is in this context that international solidarity and monitoring of the situation is critical. The villagers are keen to bring more international exposure to their case. They say that one of the ways in which people can provide support is by signing a petition that they will be sending to PT Hardaya Inti Plantation. They also believe that it is crucial for them to have a more detailed map of the area that clarifies land use prior to and after the plantation, and they are looking for support to help finance this work. The community have appealed for national and international support to put pressure on PT HIPand the Buol district head.